With regular watering and fertilizing your new lawn will always look great! 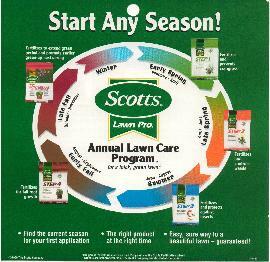 You can purchase a number of lawn care programs at your local hardware store or your larger home improvement stores. Scotts’ brand is just an example of one. The rate of applications will be on the bags. Regular Watering Is essential to an established lawn! Water the lawn approximately 1 inch of water per week during the growing season. Try to water in the early morning hours .This will help prevent a fungus from growing. Is very “Critical" in establishing a new lawn. After taking delivery of your new sod you should get it unrolled within 24 hours of delivery. When the temperatures are above 80 degrees you should start watering the sod as you our laying sections out. Use a garden hose with a sprinkler and after you unroll a couple of pallets start watering that area. Moving the sprinkler as you progress. Water sod thoroughly after laying. Peel back a roll of sod ,your finger should easily penetrate the soil beneath .The first 2 weeks, water the sod everyday 1/2 in. to 1 in. per day. Depending on how hot and windy it is. Use common sense...74 degrees + more water….50 degrees - less water. You can start reducing the amount of watering after 2 weeks. The insect that gives us lawn owners the most trouble is, the white grub. Which is the larvae of the Japanese Beetle. Because you our watering and feeding your yard to maintain it’s lush beauty, this attracts the Japanese Beetle to your yard, the perfect host for raising its young. There are treatments for the grub, but none are 100 % eradication proof. We recommend that you treat your yard once a year for the insect. The best time to treat for grubs is from June till August. There are a few treatments you can use. Consult your local hardware store or larger home improvement store. Mroczek Sod Farm 1-269-646-2009 or you can call Scotts’ consumer helpline : 1-800-543-TURF. Also see http://landscaping.suite101.com/article.cfm/how_to_lay_sod for more information on preparing for sod, laying sod, sod types, and advantages of sod over seeding.